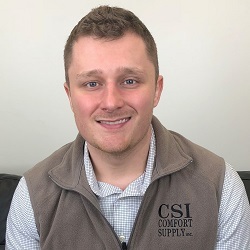 Zac Tarpley – Comfort Supply Inc.
Before this I was at a mechanical contractor that CSI used to do business with, and I got a call from Dave. I decided it was time to pursue another opportunity so I made the switch. It was an easy transition because CSI not only sells products, we sell services as well. My favorite part about CSI is the diversity of the product line, and the fact that we are always trying to find the next big product. Growth and knowledge- there is so much out there to learn. A year and a half ago I climbed the Karwendel mountain range in the Alps. The best part was at the top, they had a soup kitchen so we celebrated with soup and a beer.